Often I sneak off to the beach...it's there I write and recharge. On the way there is a two lane back road country highway and a man who sits in a golf cart watching intently each car that passes. He has been there as long as I can remember and I have seen him age over the years. And still he sits at the end of his driveway, faithful to his post. I wonder what he’s thinking? What motivates him to show up day by day? And then it hit me...he gets it. He understands every person’s deep need to be seen. In his own unique way he is giving that which he may long for himself - to be seen as he sees. And then I thought of the devastating news we were hit with this week. Two celebrity suicides. Most of us would admit we never knew them personally, but we may have carried a bag with Kate’s name on it or vicariously lived through some of Anthony’s adventures watching him on television. We were connected, albeit from afar, and our hearts felt the loss. Suicide is now considered the 10th leading cause of death in the United States and each year an approximate 44,965 Americans die by suicide. The rate of suicide is highest in middle age. In my state of Alabama, one person dies by suicide every 11 hours ( American Foundation for Suicide Prevention). Suicide and suicidal attempts are escalating. Although we are connected by large numbers of Facebook friends and Instagram likes by people we may not even know...we are starved for connection. We are in a crisis of feeling invisible in the midst of the crowd. We long to be seen. Can “seeing” each other and “allowing ourselves to be seen” wipe out the epidemic of suicide? It can start. Through stopping to listen, exchanging pleasantries, sharing a smile, a wave, a hug, taking the time for heart to heart conversation with our loved ones...all practices of seeing and being seen. For suicide is a disease of disconnection - and when one person falls into a despair driven death - we all mourn for we are on this journey together. It is time for all of us...young and old alike...to counteract the disconnect with act of true connection in our own unique way...by seeing and allowing ourselves to be seen... before any more beautiful people fall. Will you help me? Let us start a revolution of connection. I think one day I may just stop and spend time with Mr. Golfcart man...to thank him for seeing and allowing himself to be seen and gifting that to me so I could in turn gift it to you, my readers. If you are in crisis please call The National Suicide Prevention Lifeline at 1-800-273-TALK(8255) or contact the Crisis Text Line by texting TALK to 741741. 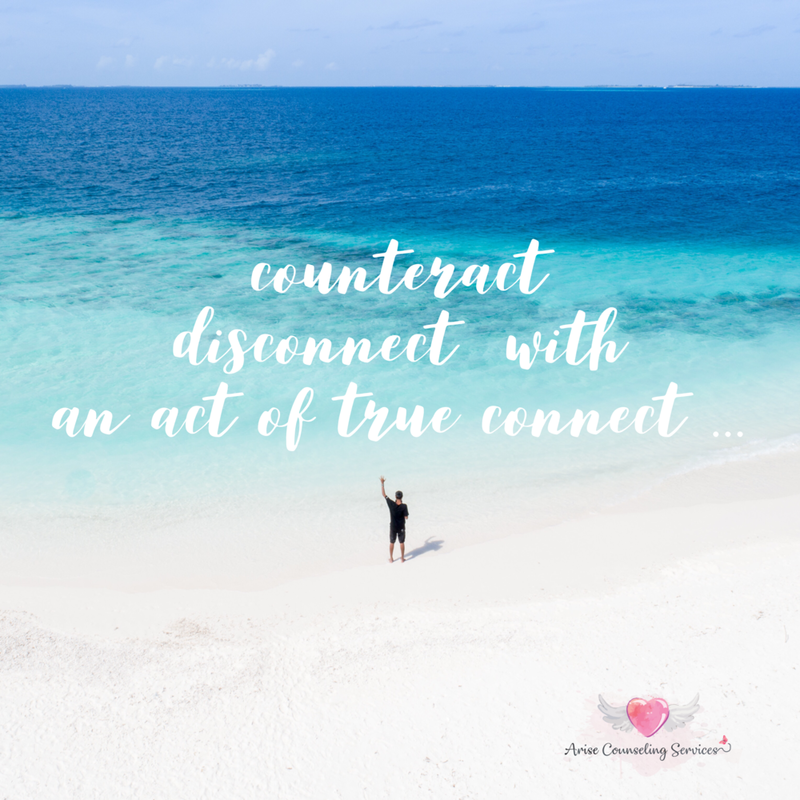 If you are feeling disconnected and in need of someone to help you make sense of how you are feeling schedule your free 15 minute phone consultation here or call 251-216-9653 today.